Look how happy our conference program made AdaCampers! Organizing a conference is a lot of work, and one of the least pleasant tasks is writing the program booklet. 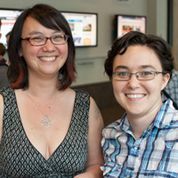 The Ada Initiative wrote the best program booklet we knew how for AdaCamp DC, with lots of help from the Geek Feminism Wiki, and now we are releasing it under the CC-BY-SA license. Now we have turned it into a reusable template including all the information you’ll need for your conference. You are welcome to reuse it for your conference! We include several guidelines that make women and all attendeees feel more welcome that go beyond a bare-bones anti-harassment policy. One example is a set of cards handed out at unconference sessions that help make discussion much more fun and interesting. Each card spells out a different useful role to keep the meeting moving: a gatekeeper (someone who makes sure everyone gets a chance to speak), a timekeeper, a leader/facilitator who keeps the meeting on track, and a note taker. Print out the cards and put one set in each unconference session and ask people to pick a role. This makes discussion way more interesting for everyone. We had a great feedback on how this improved discussion at AdaCamp DC! Check out the entire set of resources for conference organizers, maintained over on the Geek Feminism Wiki. Freely available conference booklet template designed to welcome women by the Ada Initiative is licensed under a Creative Commons Attribution-ShareAlike 4.0 International License. This entry was posted in Ada Initiative projects, Anti-harassment policy on October 20, 2012 by valerieadainitiative.